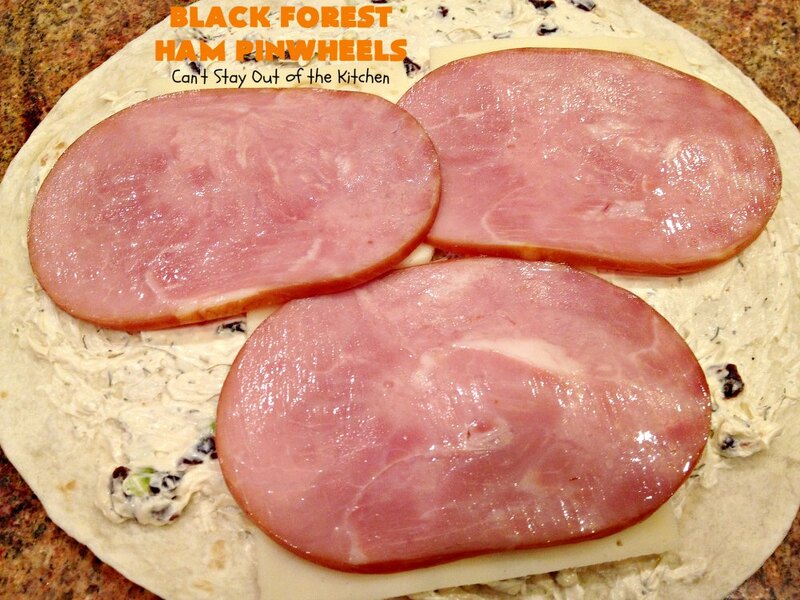 Black Forest Ham Pinwheels are spectacular! These lovely tortilla roll up appetizers are just like eating something from the Black Forest in Germany. They are filled with thick slices of smokey ham, Swiss cheese, and have a delicious spread made with cream cheese, lemon juice and Dijon mustard, then seasoned with dill weed, dried cherries, and green onions. They are absolutely wonderful. I was frankly amazed at the combination of flavors and textures in this roll up. Everything worked together very well. 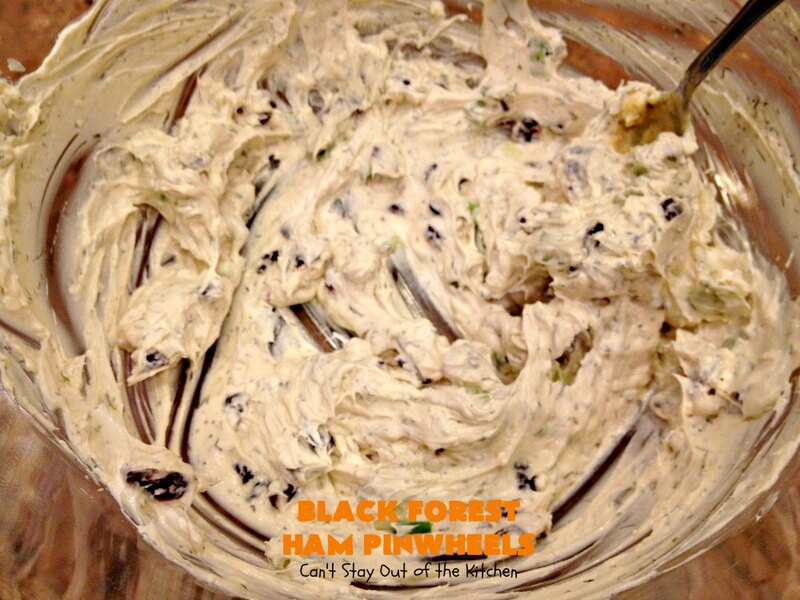 Black Forest Ham Pinwheels have just enough crunch, just enough smoothness, just enough creamy texture, just enough spice with the Dijon mustard, and just enough flavoring with the dried cherries and dill weed to be really special. On top of all that, they had a burst of flavor with the ham and Swiss cheese slices. Since I chose to use thick slices of ham and cheese rather than a deli-style that’s paper thin the flavor really popped. They’re not overly difficult to make either. These are great to prepare ahead and serve later after a busy day taxiing kids to activity after activity after activity! Last week I made these delightful roll ups and wondered how they would be received since they had dried cherries and dill weed in them. I needn’t have been afraid. Everyone RAVED about these delicious pinwheels. The dried cherries brought a slight touch of sweetness to the pinwheels, the dill brought needed flavor, and of course, everyone loved the ham and Swiss cheese! I thought they tasted heavenly, although I wouldn’t have minded having double the amount of spread on each pinwheel! Even still, these tasty appetizers were one of everyone’s favorites from last week’s group of Vacation Bible School workers. This group of folks have gotten to the point where they pretty much trust that anything I make. They know it’s usually going to taste pretty well even if it’s not something they’re used to eating. I found the recipe in the Taste of Home archives a couple of weeks ago when I was trying to figure out several tortilla roll-up recipes to make for appetizers for the brunch spread I was providing for our VBS workers at church last week. At first I thought I would make them since they were so different from the usual Tex-Mex style roll-up. Then, I scrapped them from the menu thinking these might be too much with the dill and the dried cherries. Then when I was making one of the other pinwheel recipes and realized it only made enough appetizers for about 20, I knew that wouldn’t be enough so I went ahead and made up a batch of these anyway. I am so glad I did because people kept coming back for more! I ended up cutting them in half from the original size so everyone could get a piece. If you’re looking for a substantial roll-up with plenty of meat, cheese, and flavor, that’s also hearty and filling, then consider Black Forest Ham Pinwheels. As I stated earlier, they are not all that difficult to make. You do need to do your best to roll them up tightly and it helps to refrigerate them for several hours before cutting into serving pieces, but overall you get a great reward for very little work! You can always secure the pinwheels with toothpicks if you have any problems with them staying together. The rave reviews from your kids will be worth it! 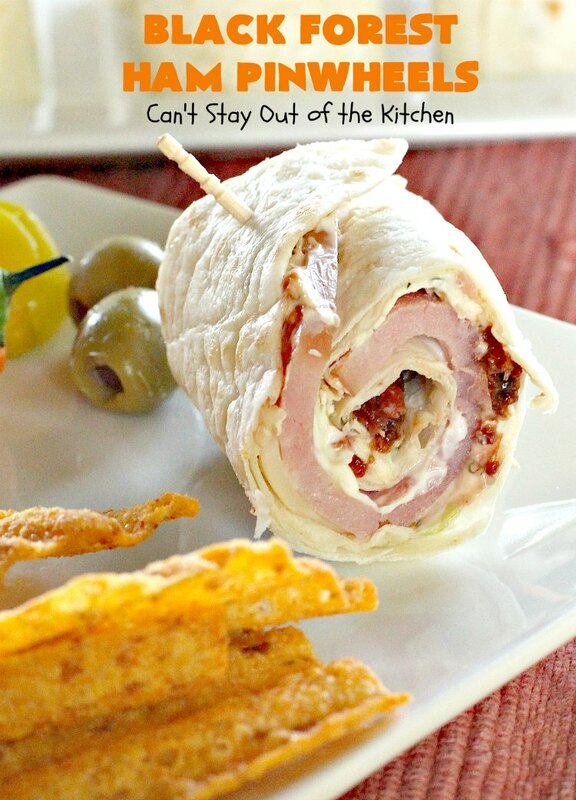 Black Forest Ham Pinwheels are a keeper for sure! 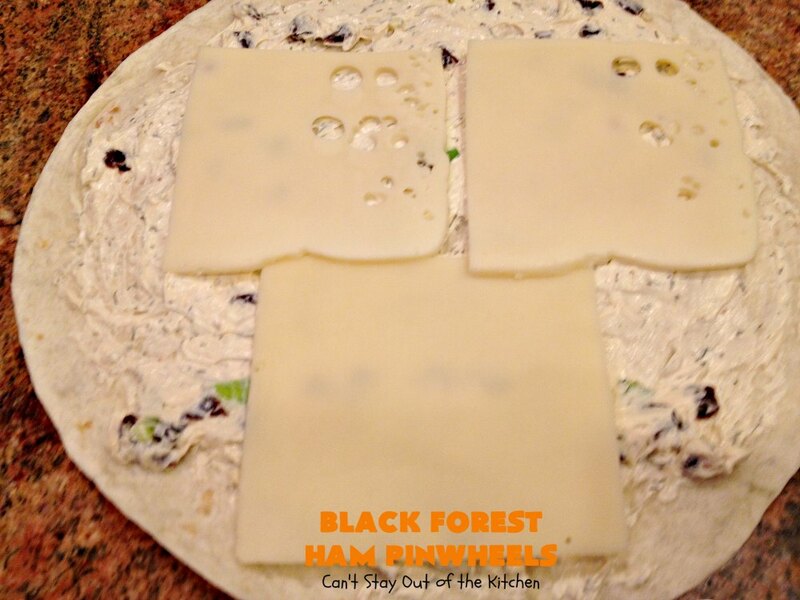 Black Forest Ham Pinwheels are a delicious and tasty snack or appetizer. I ended up cutting these in half horizontally in order to serve all those I needed to serve! 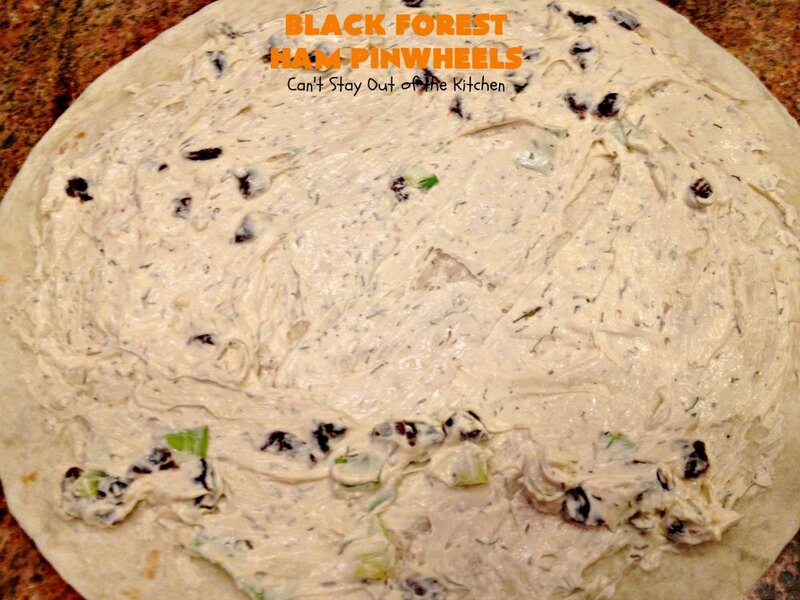 These Black Forest Ham Pinwheels went fast. I secured some of the pinwheels with toothpicks to hold them together better. These make a great lunch meal or serve for snacks anytime. Dice up the dried cherries. Set aside. Soften cream cheese and place in mixing bowl. Add dill weed, lemon juice, Dijon mustard, dried cherries, green onions and salt and pepper to taste. Spread cream cheese mixture on tortilla to the edges. Layer Swiss cheese slices over top. Then layer ham slices over top of the cheese. 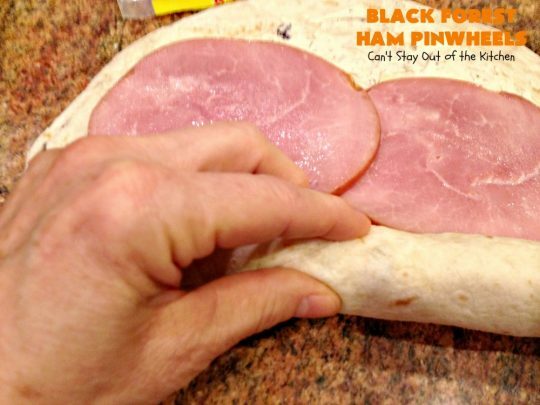 Roll up as tightly as possible without tearing the tortilla. When finished, secure the edges by applying a little of the cream cheese mixture along the edge of the tortilla. Then wrap the tortilla in plastic wrap and refrigerate for several hours or overnight. Cut in 1/2 to 3/4-inch pieces. Secure with toothpicks if necessary. 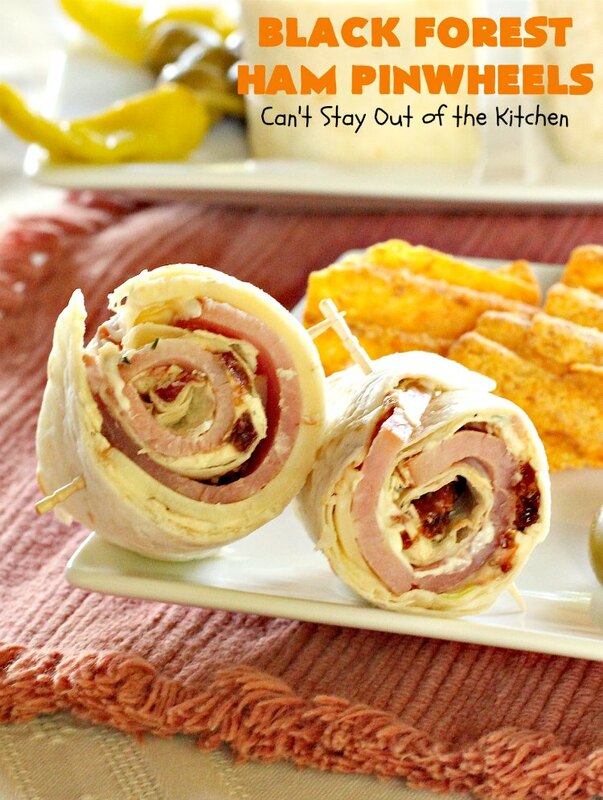 Serve Black Forest Ham Pinwheels with a relish tray, chips, or the veggies of your choice. Each pinwheel is filled with delicious tangy Swiss cheese and smoky-flavored ham. Yum. These taste wonderful with olives and pepperocinis. The pinwheels are pretty hearty and filling. You could even make this recipe ahead for a busy day and have it for supper! Some of the end pieces were hard to keep together so I secured them with toothpicks. Even the teenagers raved about these pinwheels. They really turned out to have a wonderful taste. Don’t be afraid to use the dill weed or the dried cherries in the recipe. 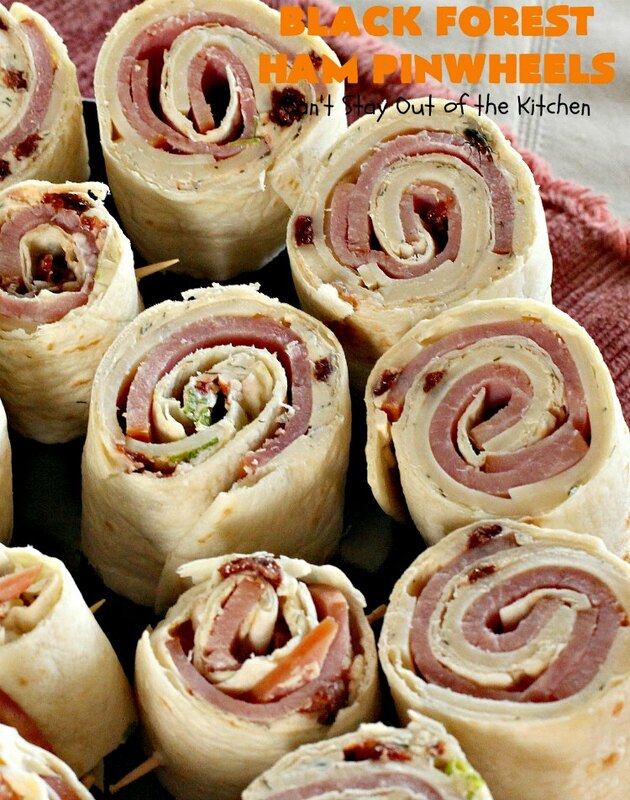 They are what make this smoky ham pinwheel so special. Fantastic tortilla roll up with Black Forest ham, Swiss cheese in a delicious cream cheese sauce with dill weed, Dijon mustard, green onions and dried cherries. 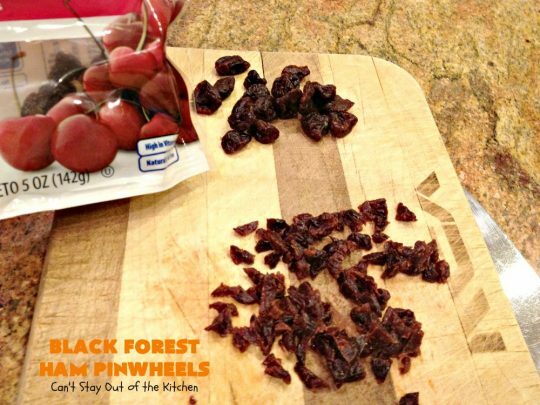 The cherries turn this pinwheel into a superior appetizer snack. Perfect for tailgating or Super Bowl parties! 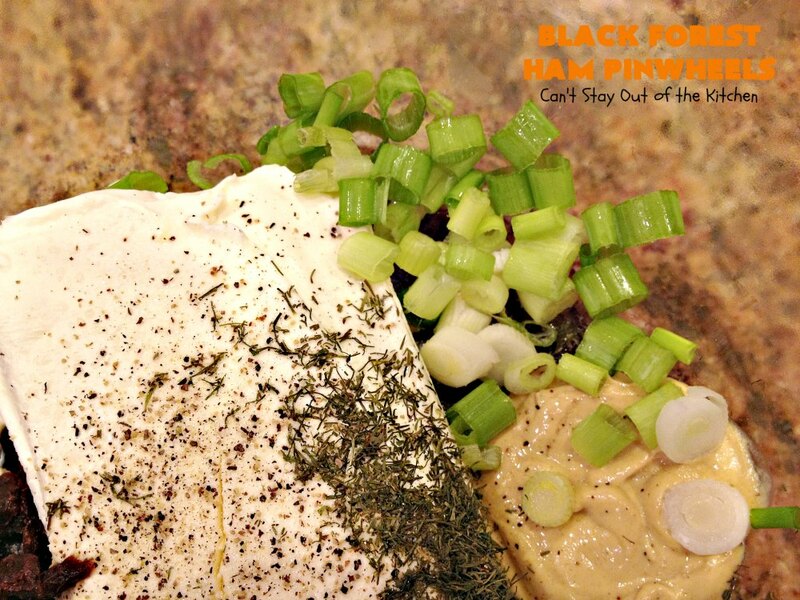 Combine cream cheese, dill, lemon juice, mustard, salt and pepper, cherries and green onions and stir to combine. Place about one-fourth of this mixture and spread over a tortilla covering in a thin layer completely. Place one piece of meat in the center bottom of the tortilla and spread two more pieces just above it to cover the tortilla from about the center of the tortilla down. Place cheese slices over top of the ham slices. Roll up as tightly as possible and seal edges with a little of the cream cheese mixture from the bowl if necessary. Roll in plastic wrap and refrigerate at least 4-5 hours or overnight. 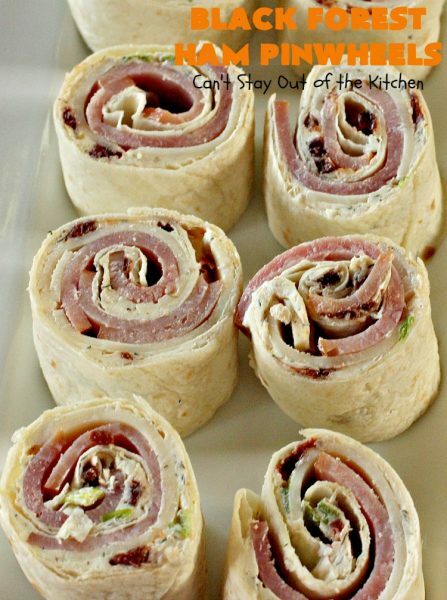 Fantastic tortilla roll up with Black Forest ham, Swiss cheese in a delicious cream cheese sauce with dill weed, Dijon mustard, green onions and dried cherries. 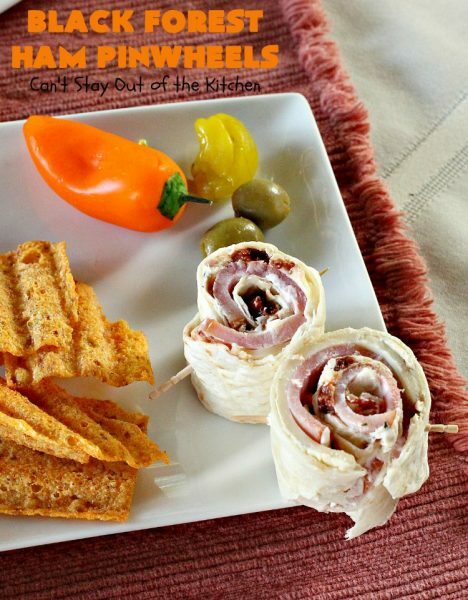 The cherries turn this roll up into a superior appetizer snack. 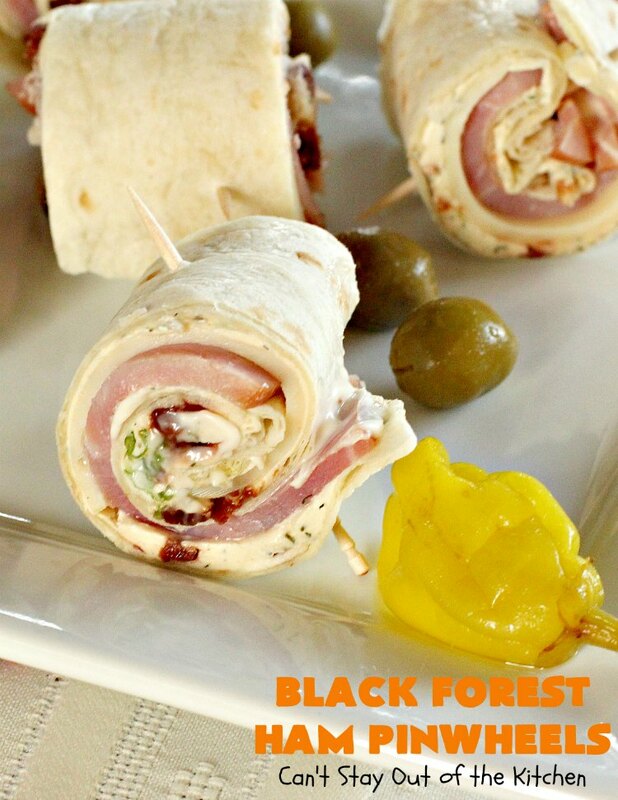 You have to taste Black Forest Ham Pinwheels to believe how great they really are. 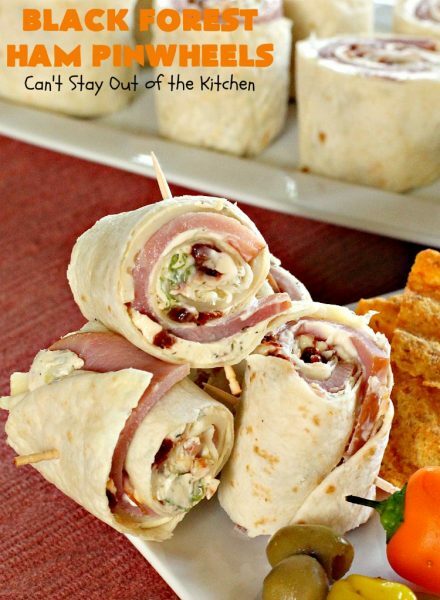 These are also great to serve for tailgate parties or when watching sporting events on TV. Black Forest Ham Pinwheels are a great appetizer to serve for company. They are so D-E-L-I-C-I-O-U-S!!!! 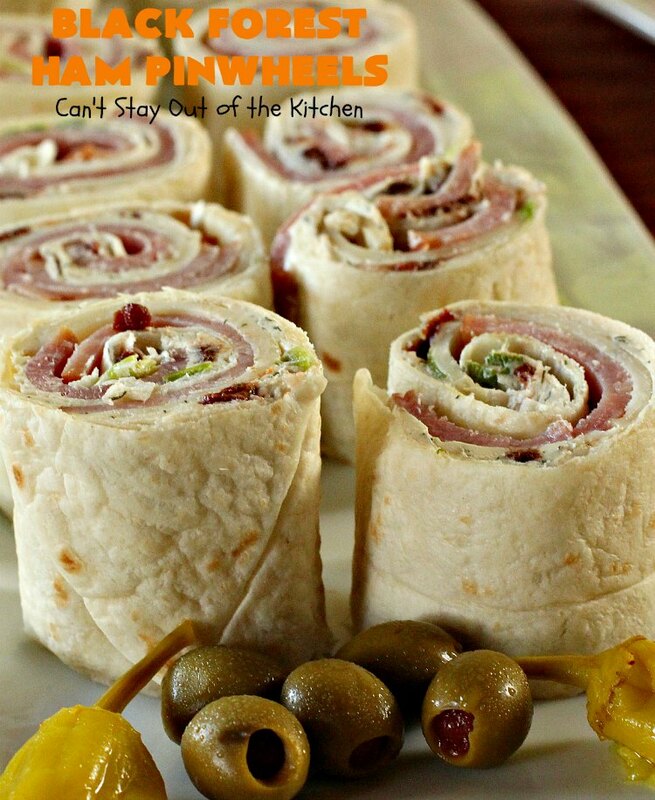 If you like roll ups, then you need to put these on your menu sometime–especially if you’re serving a lot of finger foods.